(Reuters) - Egyptian President Abdel Fattah al-Sisi said he wished the imprisoned Al Jazeera journalists, convicted of aiding "a terrorist group", had been deported and not put on trial, a newspaper reported on Monday. Sisi's comments sparked hope for the family of Australian reporter Peter Greste who, along with colleagues Mohamed Fahmy and Baher Mohamed, was jailed last month for 10 years. Sisi was quoted by Egypt's Al-Masry Al-Youm private newspaper as saying the verdict "had very negative effects". 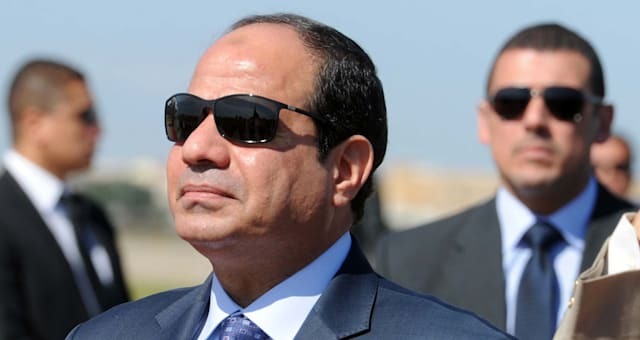 "I wished they were deported right after they were arrested instead of getting put on trial," Sisi added during a meeting with local journalists on Sunday. Sisi's initial reaction to the ruling was that he would not interfere in court verdicts. Monday's comments could be a hint he might use his presidential power to pardon the journalists, who still have a chance to appeal against the verdict in a higher court. Peter Greste's brother, Andrew, said he was heartened by the comments. "I'm sure images of Peter in the cage in the court are not images Egypt really wants distributed around the world," Andrew Greste told reporters in Brisbane. "And the publicity they're getting out of this I'm sure is not the publicity any country would want." Peter Greste, Al Jazeera English Cairo bureau chief Fahmy, a dual Canadian-Egyptian citizen, and Egyptian network producer Mohamed were detained in December. It was unclear how Mohamed could be deported. Sisi, in his reported comments, did not specify the journalists by nationality or name. The three were convicted of aiding a terrorist group - a reference to ousted president Mohamed Mursi's Muslim Brotherhood group - by broadcasting lies that harmed national security and supplying money, equipment and information to a group of Egyptians. Egypt has banned the Brotherhood and declared it a terrorist organization. Andrew Greste said he was not sure if the comments would lead to a resolution. "I'd like to think that there's things happening at all levels ... and everyone can talk about it and seek an amicable solution," he said. Former army chief Sisi last year orchestrated the ouster of Mursi, a senior Muslim Brotherhood member, in reaction to mass protests against his rule. Mursi's removal was followed by a security crackdown on Islamist activists and some media outlets, including the Qatar-based Al Jazeera network. Al Jazeera, whose Qatari owners back the Brotherhood and have been at odds with Egypt's leadership, said the court ruling defied "logic, sense and any semblance of justice". Washington had described the sentences as "chilling" and "draconian" and Britain, whose ambassador attended the ruling hearing, summoned the Egyptian ambassador to protest.